Has America normalized violence as a way of life? 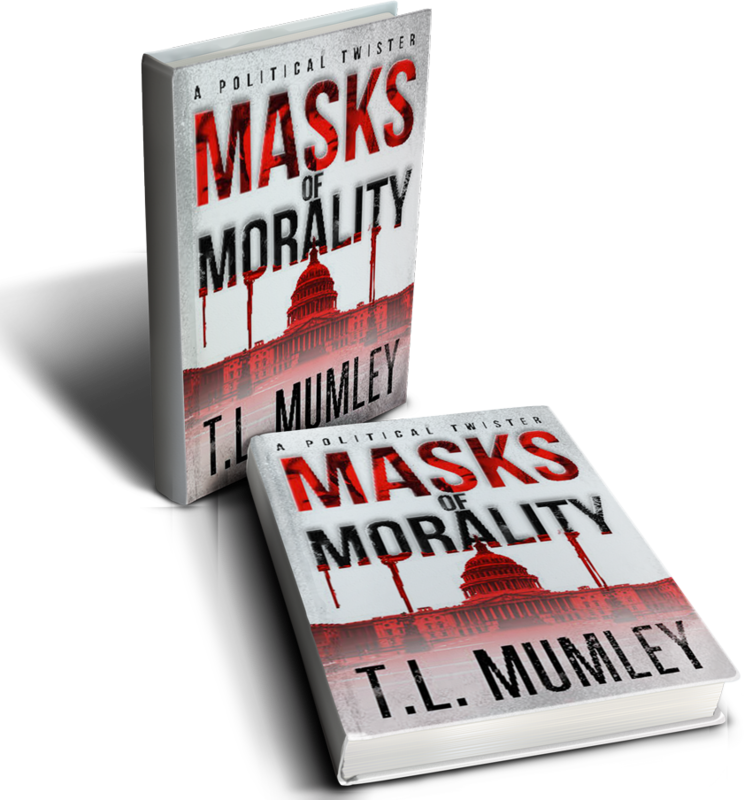 MASKS OF MORALITY is a contemporary rollercoaster about a woman obsessed with changing the world after becoming a mother. It is a story of human compassion, moral conscience, family love and focusing positive energy in every choice we make. 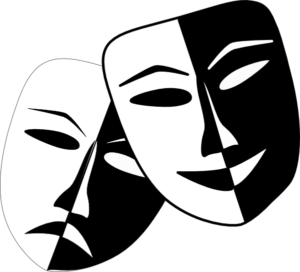 A cry to look past the deceiving masks of media and politicians, and into our soul for answers how best to treat each other—how to be kind to humankind. It is a message of social justice. The book is written in the voice of a mother who couldn’t be happier with her life. She is surrounded with surreal beauty, a loving family, a large circle of friends, a tight-knit community, an amazing home and contrary to her quirky emotions, inner peace. Her only concern is for the next generation in a nation hell-bent on having higher military spending than half the world combined and convinced it’s for the collective good. She recognizes it's about profit, not to keep anyone "safe." A marketing spin for unscrupulous business sectors driven into many cornerstones of America. With gun manufacturers now vying to profit through the most vulnerable distribution channel in the world: our children's schools. Isn't it time we, as a society, normalize peace? Caryssa Flynn was a driven high-tech marketing professional with the computer network world hard-wired into her brain. The allure of power and money pulled her three-thousand miles away from everything she knew and loved, to the San Francisco Bay Area. In Silicon Valley, work became her identity as she helped build a global virtual reality. Until at age forty-two, she gives birth to her only child and nothing is about herself anymore. As she dives into motherhood, she never gets back to her high-powered career. However, she realizes how "defense spending" was integral to the internet and development of Silicon Valley --- and linked to perpetual wars for profit. Although never anti-corporate, she ponders multinational corporate abusive practices. What type of legacy is our war economy leaving for our kids? The world? It's as if everything clicked when seeing the world through her child's eyes, playing out his favorite Sci-Fi as a present-day dystopia. Star Wars has come to America, and we can't even rely on Obi-Wan Kenobi. She befriends a group of parents as eclectic as the cafes, shops, and beauty surrounding them. This includes Stan Gafferty or "Mr. Mom," a brilliant molecular biologist who becomes a stay-at-home dad after developing cancer from exposure to hazardous chemicals at work, Samantha Owens, a struggling paralegal in emotional turmoil about spending enough time with her son, and Bryan Garrity, a father of twin boys who was disowned as a teenager by his ruthless, rich and powerful father for not following in his political footsteps. Introduced along the way is Anna Beauvais, a charismatic and successful artist originally from Paris who tragically lost her two daughters. As this woman’s heartbreaking past emerges, painting a portrait of the fragility and resilience of family, a deep and abiding admiration for her emerges--especially after the group witnesses her empathy and clear conscience putting a boy's life over the immorality of legal greed. Living variously through Anna’s pain and strength aids in setting the path in understanding what really matters in life…love and family. When Anna's art gallery is robbed and her security guard murdered, it shatters their peaceful community. The police find a baffling dead dove behind Anna's art gallery, with a subtle message in blood representing how peace is destroyed by war. After they discover Anna's prized stolen art pieces hold deep political influence, they wonder if there's more to the story than the two teenage girls suspected of the murder. Each of these friend's anguishes reinforces Caryssa's resolve to volunteer doing environmental and educational work in frantic efforts to save humanity and the planet from further destruction. Her whimsical, esoteric tangents can drive loved one's nuts while also feeding their souls. Caryssa, Anna, and Bryan, in particular, are faced with having to make a thorny moral decision and reach deep into their hearts and souls within certain business, legal and political aspects of an economic system putting profits before the people. They must go against the status-quo in order to do what's right and decent for humanity as a whole. Echoed throughout is a startling and disturbing awareness of a culture---ours--- mindlessly threatening to squander all that is dear to our hearts. This culture shock stirs their collective conscience, bringing them to understand the ache of late America. It transforms their lives motivating them to make a positive impact on society---for the sake of their families and children. Could it be that our political reality is stranger than fiction? Order the sequel now! Available globally on Amazon in print and SMASHWORDS in digital format. Bizarre things are happening in otherwise peaceful settings. Why? American politics is a crazy beast, performing in a three-ring circus that never goes out of style. Three Northern California women lead idyllic lives, from swanky Sausalito loft and sanctuary in the hills to skiing the French Alps. But it's not themselves they are concerned about---it's their families and the next generation. When it is discovered that dark money is behind these odd occurrences, Caryssa, Anna and Julie help a socially-emotionally wounded girl escape from powers that be, even after she nearly destroyed Anna's art gallery. A girl who reminds Anna of the daughters she tragically lost. ... AND THAT GIRL IS RUNNING FOR HER LIFE. WHAT IS SHE RUNNING FROM? WILL SHE SURVIVE? are confident they are acting on their own free will." The German politician Joseph Goebbels, who worked for Hitler, was known for his hints about the lies told to the populace through political media. Hitler had the German people convinced the atrocities he carried out were for the "collective good" of the nation. This is not unlike corporate news today, extending beyond the ultra-right politicized media criticism. There is an assault on the truth throughout our media outlets whether liberal or conservative angle. Why? A small group of five huge corporations owns all our media, so we can question how data can be manipulated online, on TV or in newspapers. 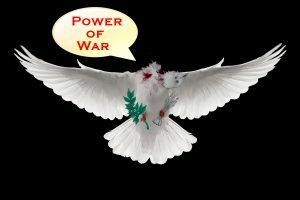 These large multinational corporations are war-profiteers, often presenting fiction as fact to fuel the fires. 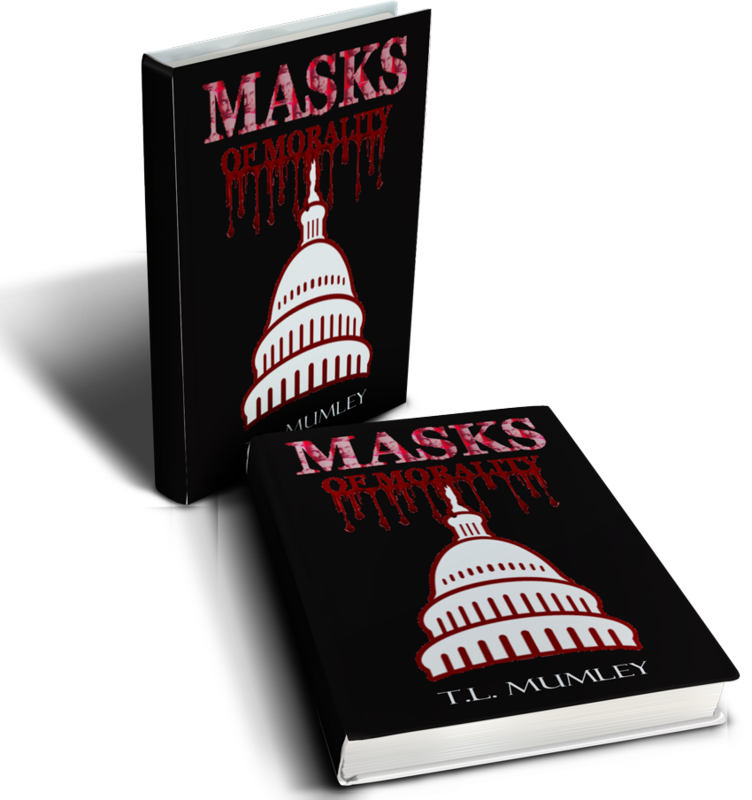 IN MASKS OF MORALITY, Caryssa sees firsthand after growing the high-tech corporate ladder, how the networking backbone of the global internet was built by a defense agency on the dark side. Her much-loved Silicon Valley and the high-tech industry, in general, is rooted in backing from the US Military. This eats at her soul, with the realization the best part of her own career and what tore her three thousand miles away from her loving family feeds into her only fear in life: America's self-destructive war economy and what it means for her child's future---to the future of all generations. Modern society is organized into industrial and professional corporations serving as organs of political representation to the people, exercising control over opinions on world happenings. Mind control and manipulation are now done the high-tech way operating as virtual mind police. Americans and citizens around the world are in a quandary as to what they can believe. To come to the defense of that great marvel called the internet I helped bring to the world, we can't blame it all on technology---we just need to stop using technology as a weapon under the deception of protecting "national security." There is a hidden force keeping journalists from telling the truth--- even threatening them with their lives if they do. "Mainstream-media political journalism is in danger of becoming irrelevant, but not because of the internet, or even Comedy Central. the threat comes from journalists being afraid to do what journalists were put on this green earth to do...Tell the truth." Another one found outside a prison in book number two! What do Picasso and this symbolism have in common? Please read it with an open mind, heart and soul. If you love those sci-fi’s about a dystopian future, try jet-setting my words back to the future, and strap yourselves in for the ride! I promise you won’t be bored. T.L. Mumley (born Teresa Lynn Sullivan) is a former senior marketing analyst in Silicon Valley, a mother, wife and happy homebody. She holds an AS in Fashion Merchandising from Lasell, a BS in Marketing from MCLA and an MBA from Northeastern University. She has a twenty-five-year history in high-tech marketing and sales. An optimist at heart, she went on a personal crusade of community service and marketing for the greater good, often in her PJs from home office. 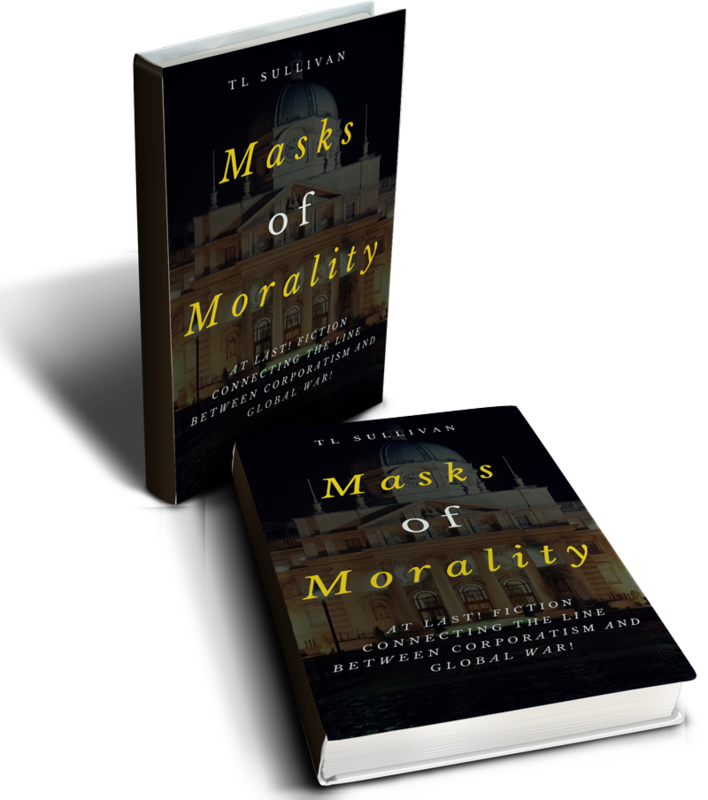 To spice up a decade of writing marketing content published in top-tier technology magazines, she aspired to become a novelist with her debut Masks of Morality. The novel has received 5-Star ratings across Amazon, Barnes and Noble, Smashwords, Inkitt and other sites. The sequel, Monster Behind the Masks, was released March 2019 and is available now in both print and digital format. Fueled by dark chocolate and good red wine, T.L. Mumley can be found skiing and hiking mountains, walking, reading or doing a downward facing dog while gardening. 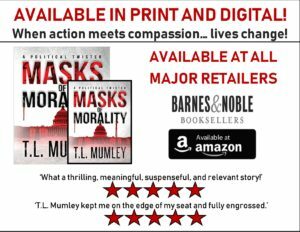 Masks of Morality has received several positive reviews from my writer's group, friends, the general public and above all, my multitalented editor, Chansonette Buck. Chansonette is a two-time Pushcart-prize nominee of heart touching chapbooks and memoir. In Chansonette’s own words, “Your novel is a page-turner! I’m finding it hard to put down. You have what it takes to tell a story in a compelling way”. 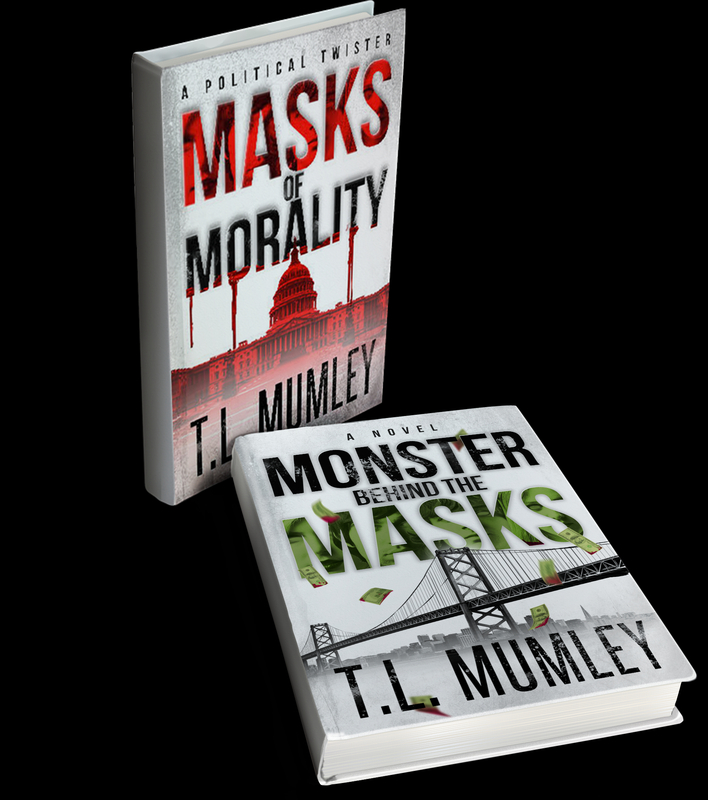 "Hip San Francisco Bay meets the bleak political reality that defines our life." -Alon Shalev, author of ten novels including AT THE WALLS OF GALBRIETH, 2013 winner of Eric Hoffer award. "Absolutely stunning read! Timely and relevant. I learned so much from a novel. Can you believe it, a novel!" "The most amazing and unforeseen twists and turns, making it a very enthralling read. It keeps you gripped to the edge of your seat." “What I love most are the flowing words. It reads like a smooth ride." “A woman fired up to change the world, why? Because she is a mother."